Here’s a selection of history books that will be digitized as part of the project. 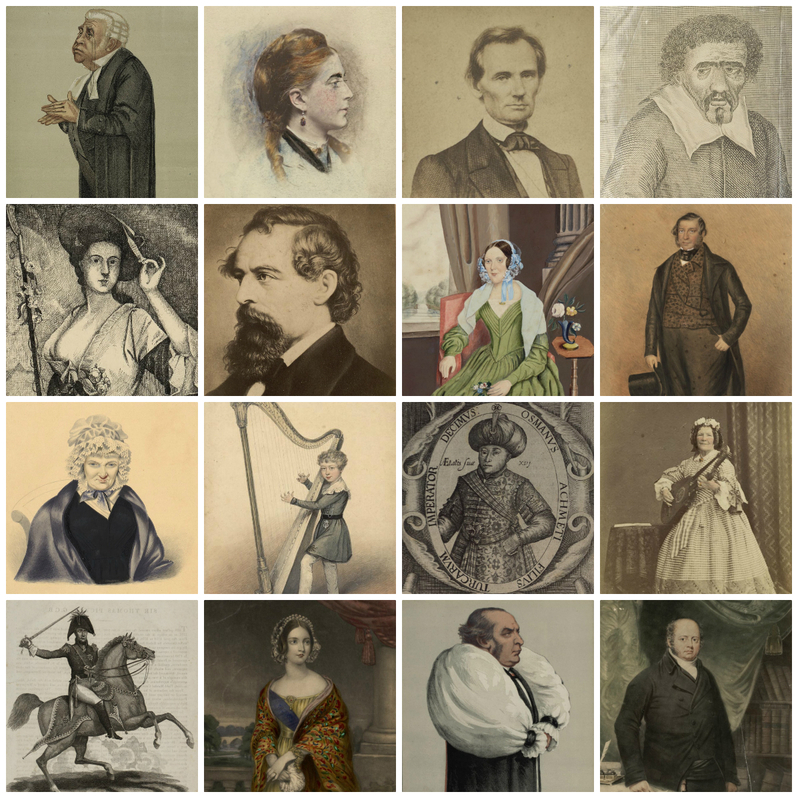 At the end of the eighteenth century and the beginning of the nineteenth century, many comprehensive texts were written on local history in Wales. 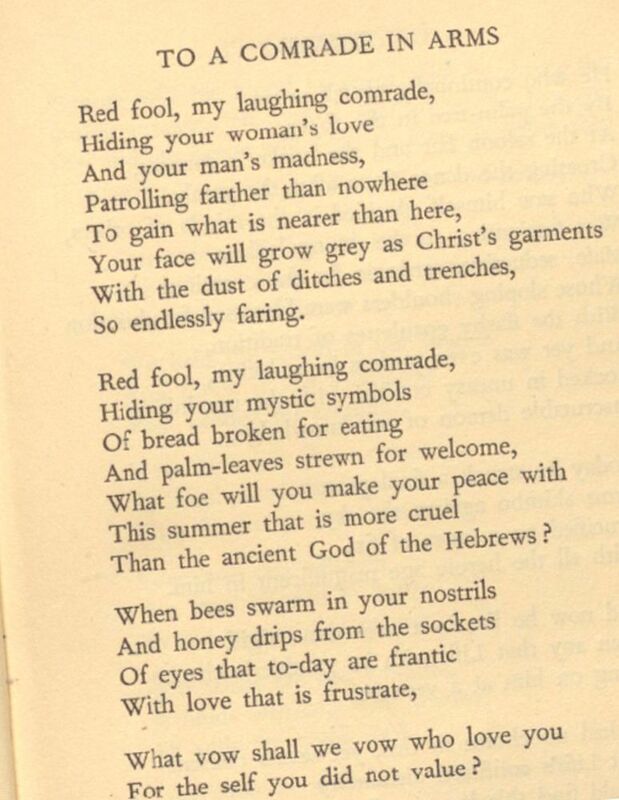 This volume by Theophilus Jones however is the most refined and polished of them all. 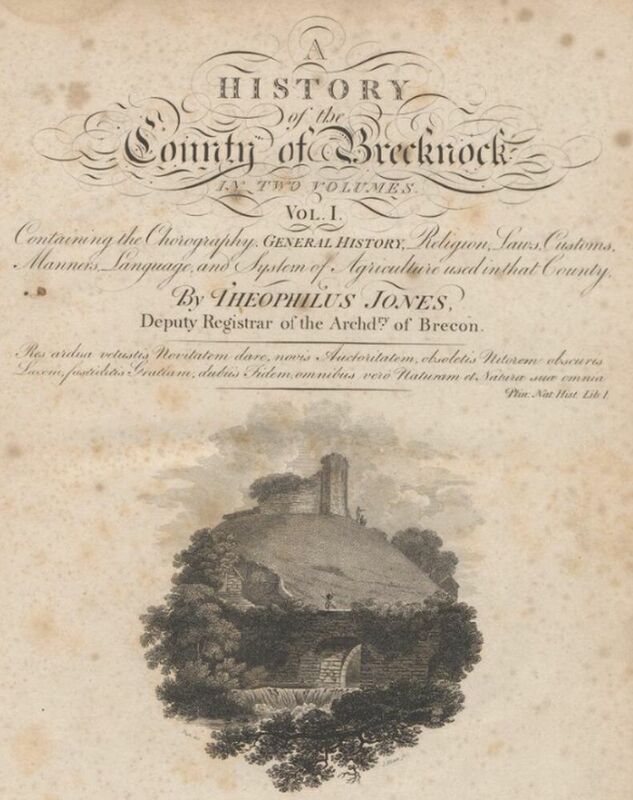 Jones’s account of the history of Brecknock is generally of a scholarly nature and despite its biased tone; it is the most noted record of local history in Wales to be published. 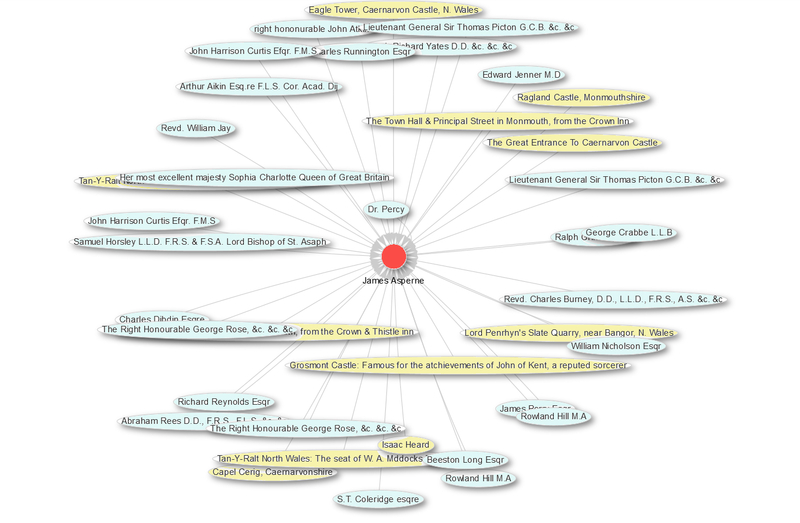 Theophilus Jones was the grandson of renowned historian Theophilus Evans. In the first half of the nineteenth century scholarly enthusiasts, mostly clergymen, across Europe, actively wrote histories on the cultures of small or underprivileged nations. Carnhuanawc is the most obvious example of such an individual in Wales. He was inspired by the same ideas as the German philosopher Herder; that all cultures are uniquely significant and valuable. They also shared the belief that such cultures were mostly guarded by the numerous, yet lower and poorer classes. 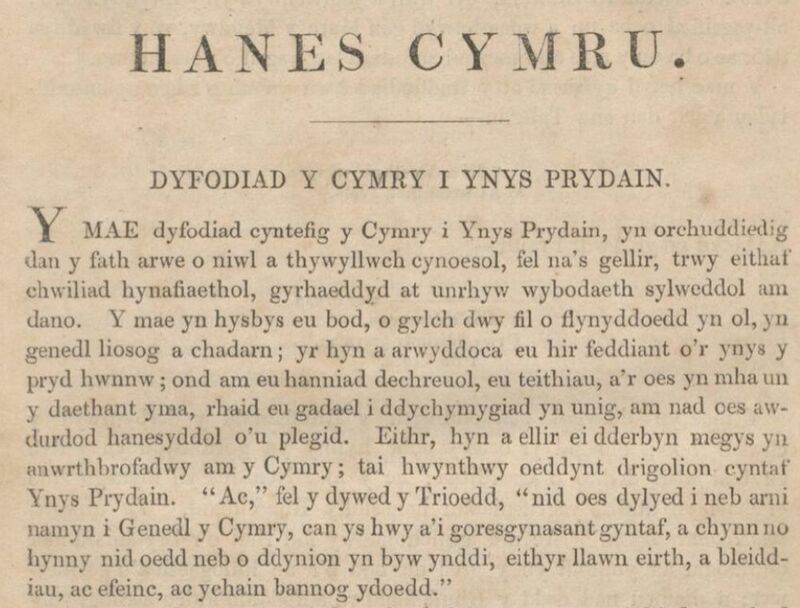 ‘Hanes Cymru’ or ‘A History of Wales to the Death of Llywelyn ap Gruffydd’ was, and is considered Carnhuanawc’s masterpiece. 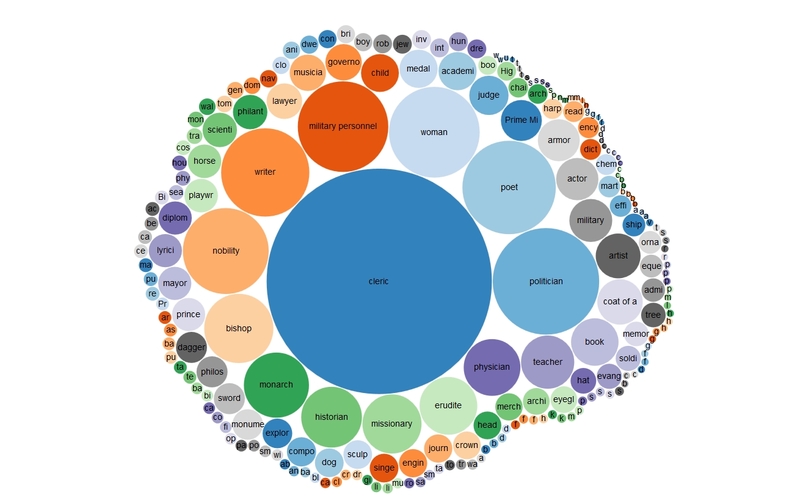 The publication appeared in fourteen separate volumes between 1836 and 1842. Though the author had an inadequate grasp on the historian’s duties, no other historical work would match that of Carnhuanawc for several years. Jane Williams was a London-born historian and miscellaneous writer. She spent many years of her life in Brecon, Wales and as a result developed a friendship with the famous cultural sponsor and supporter Augusta Hall, or Lady Llanover. Thereafter Williams took a great interest in Welsh literature and learnt the language. 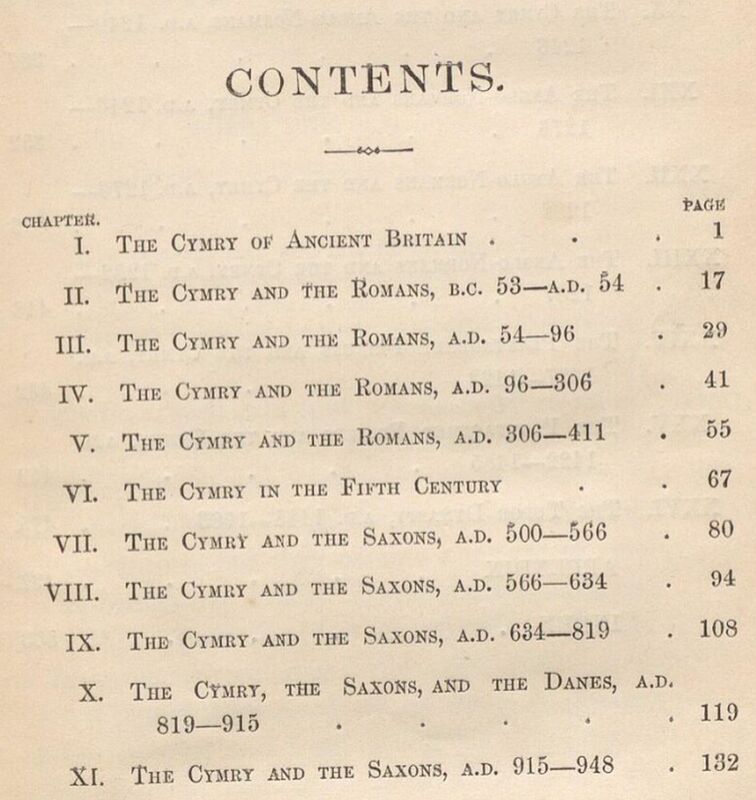 She published many important volumes including ‘A History of Wales derived from authentic sources’ (1869). 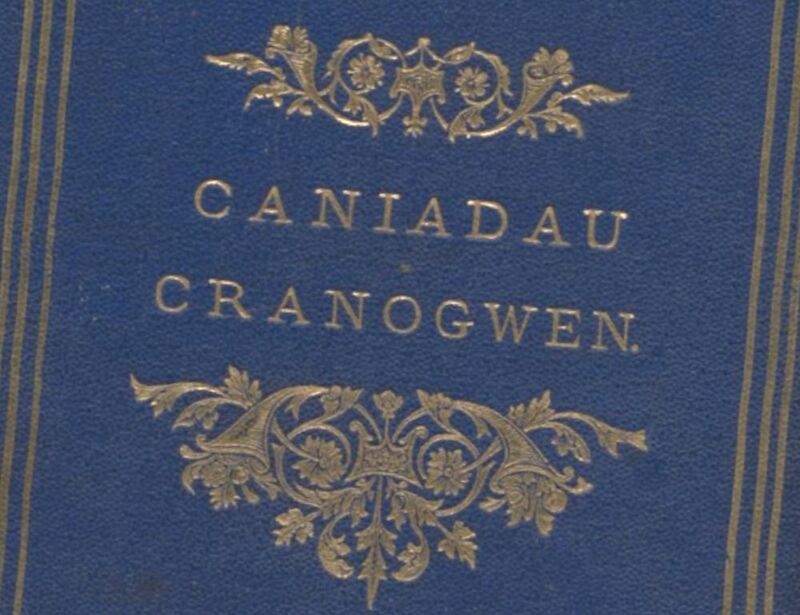 This book is a compilation of her most ambitious work, and in spite of its defects, was not superseded until the publication of Sir John E. Lloyd’s researches on the history of Wales at the beginning of the twentieth century. John Edward Lloyd was one of Wales’s most noted historians. He was educated at Aberystwyth University and Lincoln College, Oxford, where he successfully obtained a First Class degree in 1883. An academic career soon followed – he was appointed lecturer in History at Aberystwyth University in 1885 and Professor of History at the University College of North Wales, Bangor in 1899. John Edward Lloyd was a medieval specialist and he wrote many comprehensive papers on the early history of Wales. 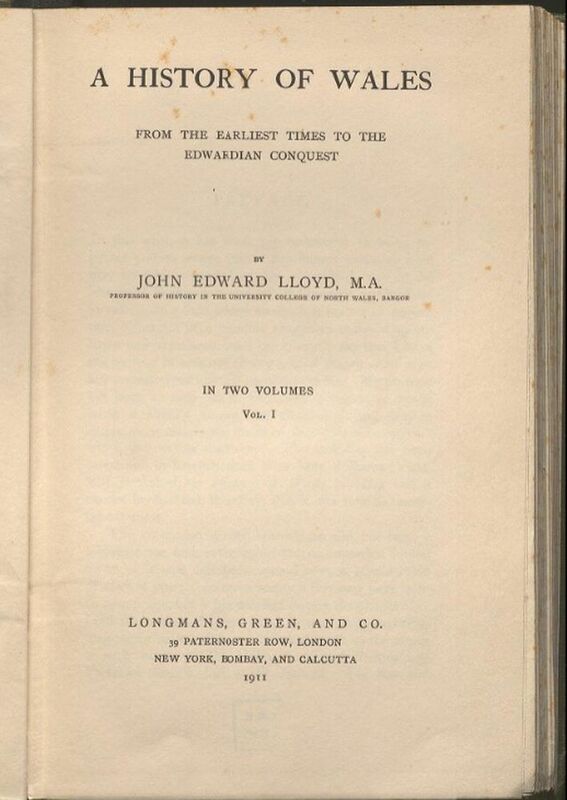 ‘A History of Wales: from the earliest times to the Edwardian conquest’ was published in two volumes in 1911 and is remembered as Lloyd’s great standard work; his masterpiece. 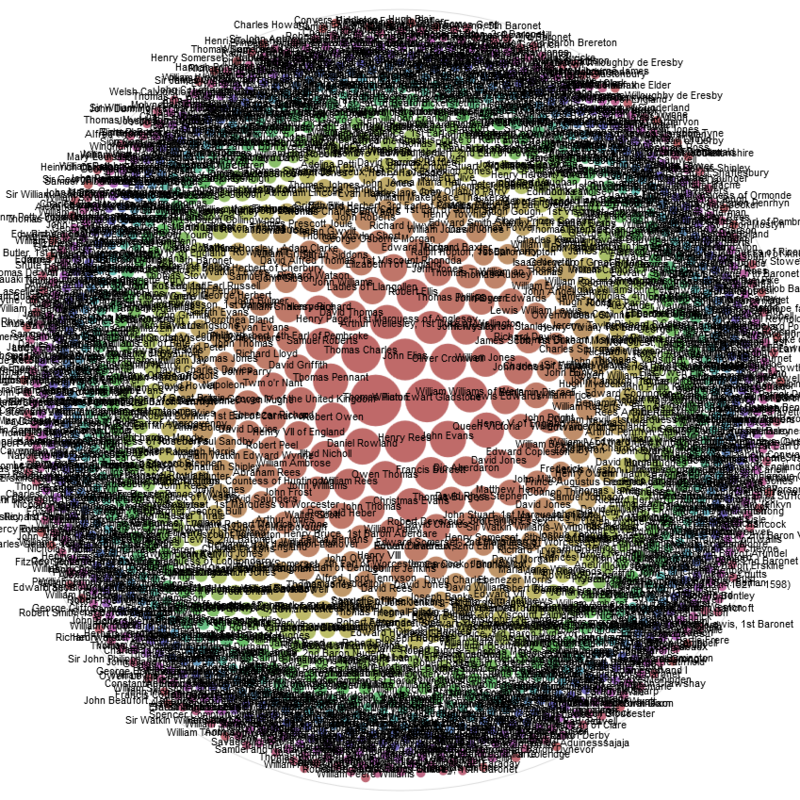 It was unique in the sense that its content was compiled through a critical assessment of the sources and thorough scientific research. 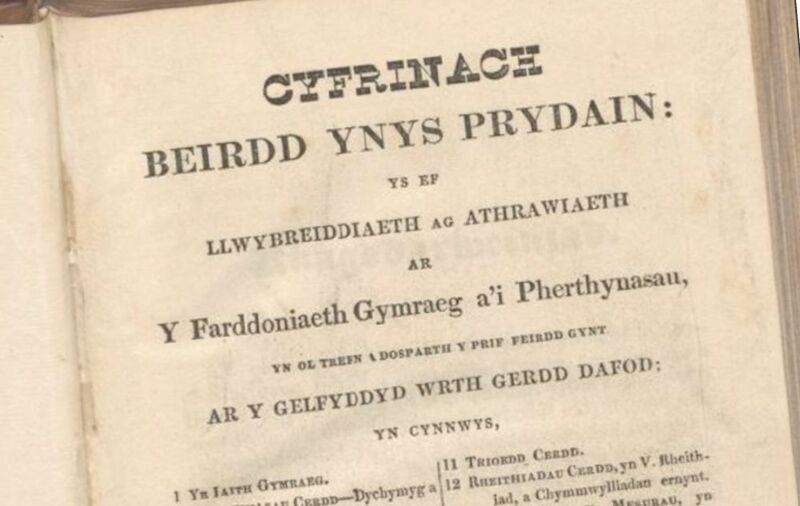 This book was a turning-point in the study of Welsh history and was arguably the first substantial publication to be considered by professionals as an authoritative assessment on the subject. It is no surprise therefore that some scholars have referred to John Edward Lloyd as the ‘father’ of the study of Welsh history. Here’s a selection of travel books that will be digitized as part of the project. Eight unique volumes of the travel book ‘A Tour in Wales’ were produced for the author’s own library at Downing, Flintshire at the end of the eighteenth century. However, the series above was condensed for public sale and two volumes were printed, one in 1778 and the other in 1781. These chronicle the three journeys Thomas Pennant made through Wales between 1773 and 1776. 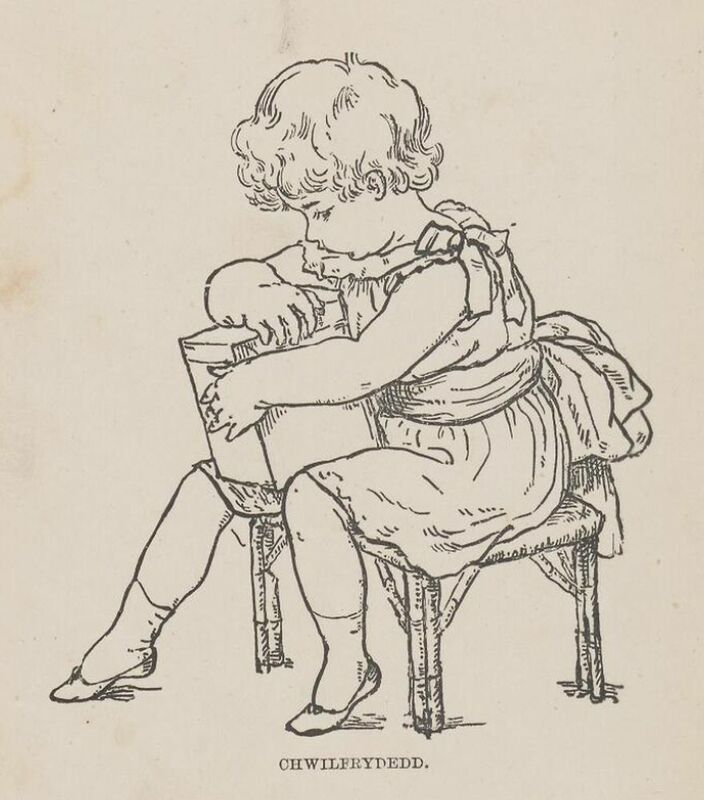 The volumes contain a number of original drawings by Moses Griffiths, Ingleby and other well-known artists of the period. Pennant is recognised today as the finest Welsh travel book writer of his time. W. E. Jones was a known printer, writer and poet. 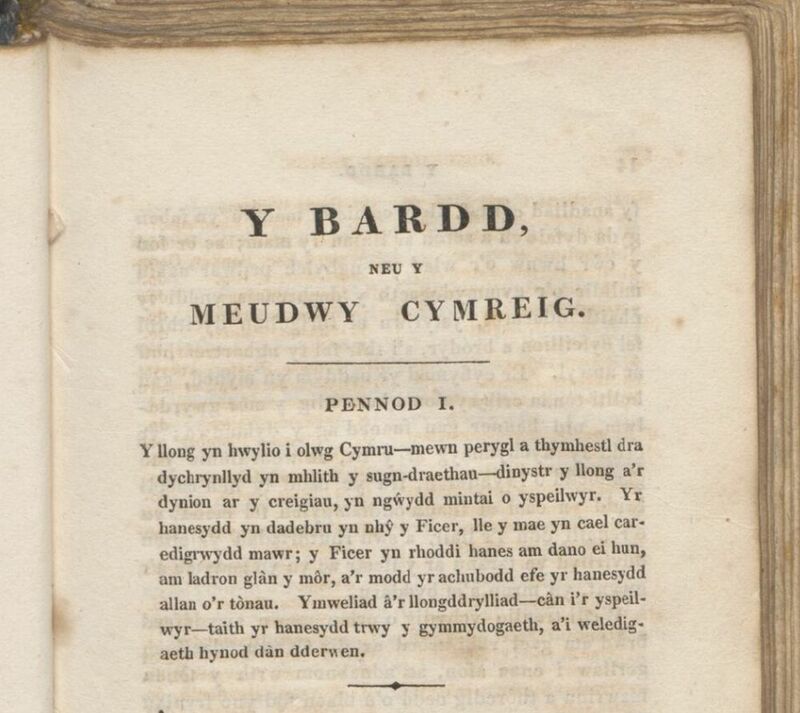 In his Welsh romantic prose ‘Y bardd, neu, y meudwy Cymreig’ or ‘The Bard, or the Welsh Hermit’ Jones presents a host of imaginary descriptions that depict various international travels. The author describes his journey along with specific locations. 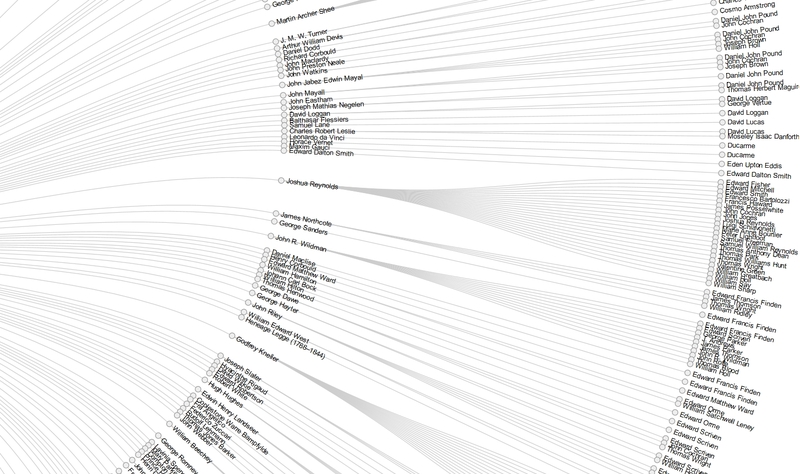 The volume has been referred to as the first Welsh novel, yet it does not possess the attributes of a novel. George Borrow was born in Norfolk in 1803. His father was a soldier, and as a result the family moved around the country frequently. He was educated in Edinburgh and Norwich. Borrow trained as a lawyer but soon took to literature and wrote novels and travel books, drawing on his many journeys around Britain and Europe. 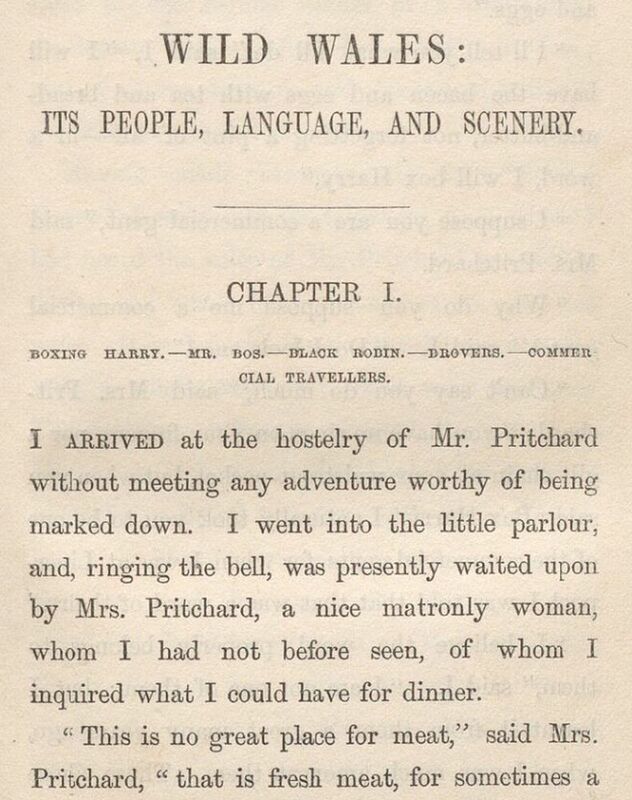 ‘Wild Wales’ describes a stay in Llangollen in the summer of 1854, with many hikes through North Wales, followed by a longer tour to and through South Wales. Borrow was a noted linguist; he spoke Welsh and had a particular interest in the origins of place-names. 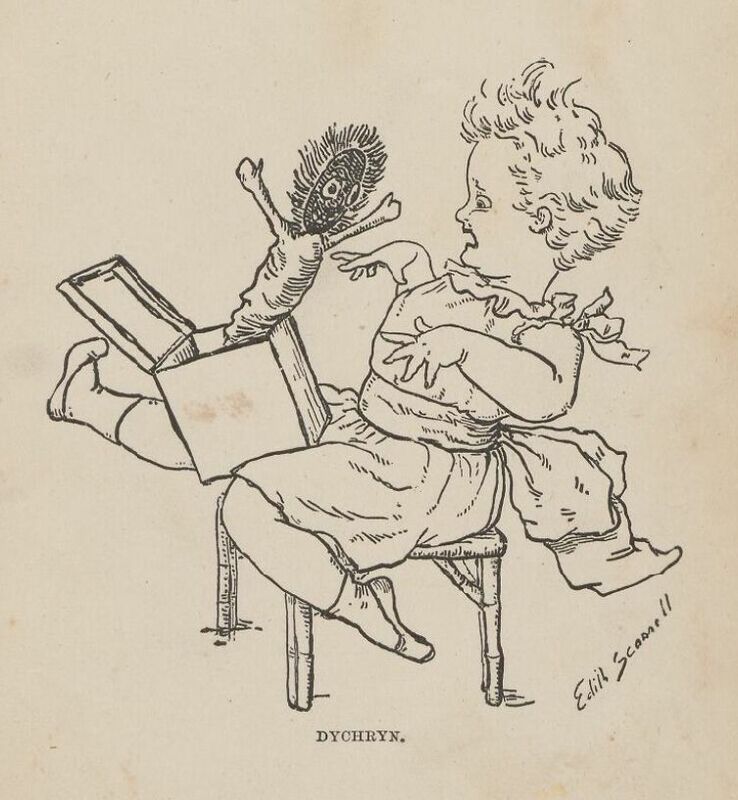 Here’s a selection of children’s literature that will be digitized as part of the project. 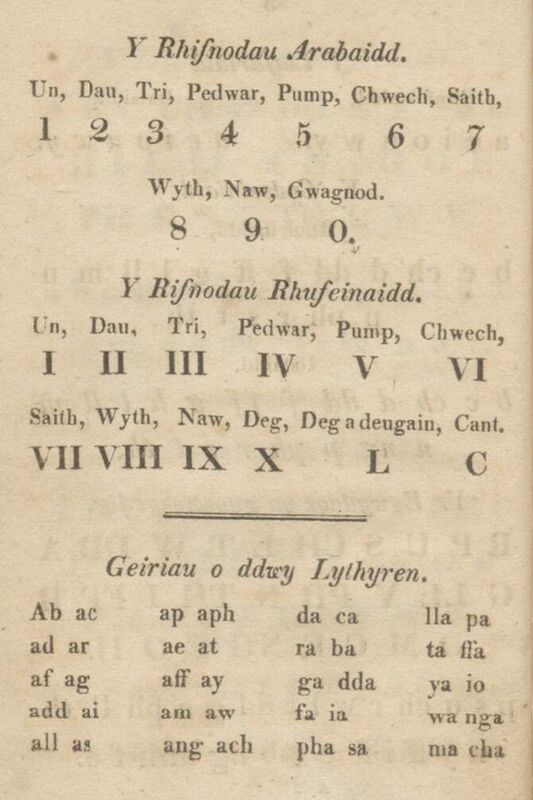 During the end of the eighteenth century children in Wales were taught to read at the circulating schools of Griffith Jones and at Sunday-schools. Both of these placed a great emphasis on the importance of understanding the Bible in order to save an individual’s soul. This volume by Robert Richards should be considered within this particular context. 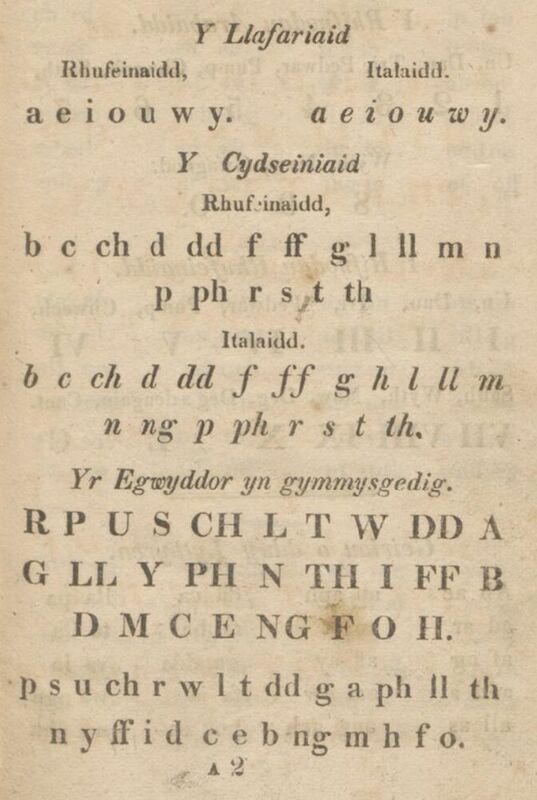 It was amongst the earliest Welsh spelling books for children, most of which were not designed or formatted with the tender years of the pupils in mind. 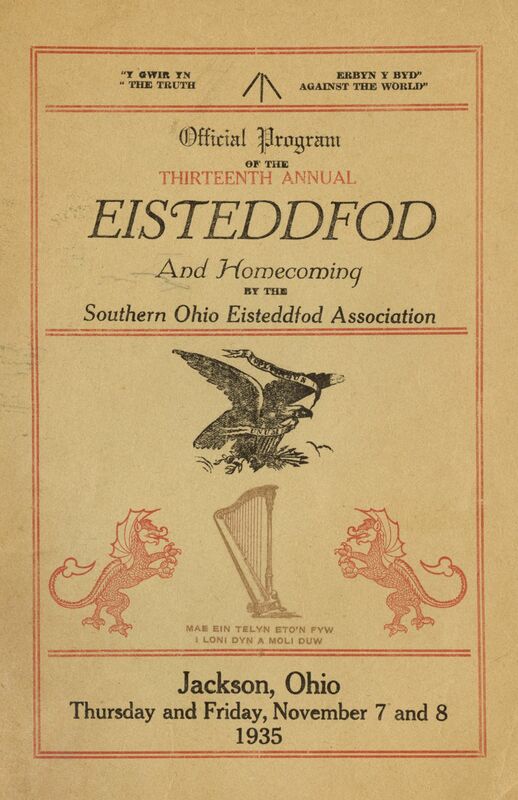 The volume’s purpose is clearly stated within its title – ‘A reader, that is a simple and clear instructor to teach the reading of Welsh, intended as a first spelling-book for children, containing a wide selection of lessons, set out in a suitable order to lead the young from step to step from the easy to the difficult’. O. M. Edwards was a renowned editor, writer, historian and educator. 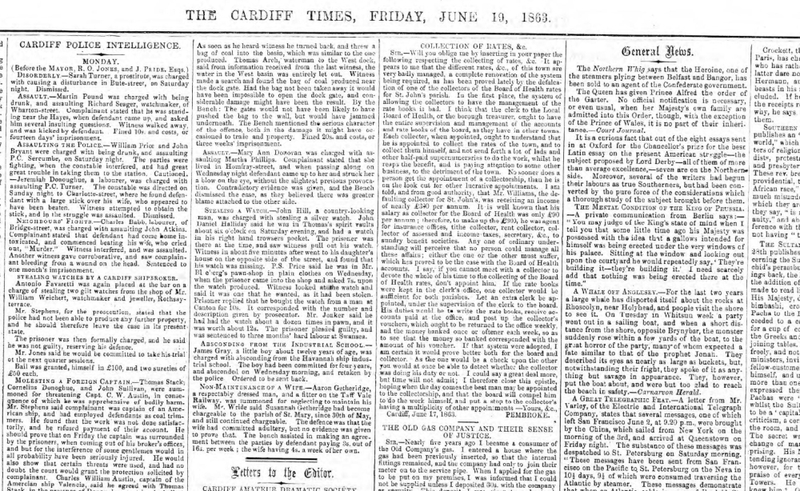 From 1888 onwards he devoted his energy to publishing popular books and journals, especially volumes concerning the history and culture of Wales. From 1896 to 1930 he was a professor of History at Aberystwyth University, however Edwards would continue to write, edit and proof-correct out of his official working-hours and often in the early hours of the morning. One cannot overestimate his service to Wales, and indeed, Edwards’s influence reached extensively further than the university lecture room. 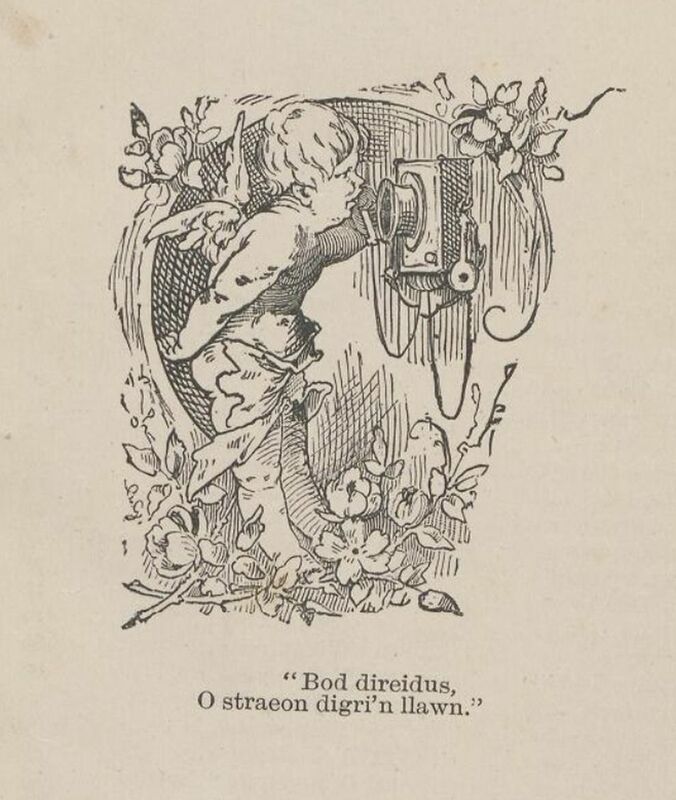 He wrote many books for children, including ‘Llyfr Del’ and ‘Yr Hwiangerddi’; a book of Welsh nursery rhymes. These books were attractive, packed with illustrations and their texts easy to read. 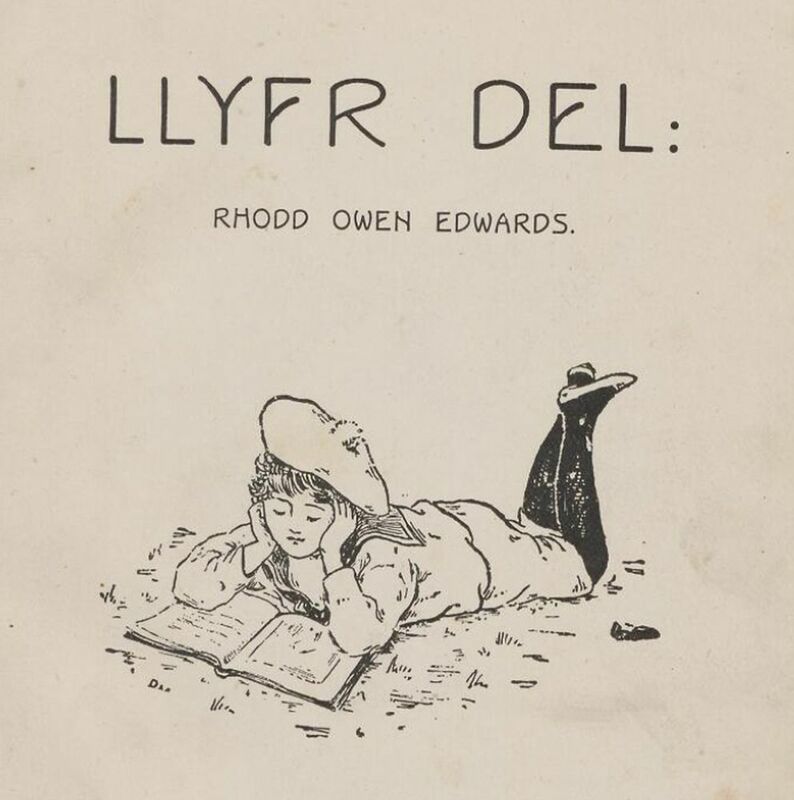 Edwards’s books for children were unique in the sense that they provided age appropriate content for a young target audience through the medium of Welsh for the first time. Hugh Evans was a noted writer and set up his own press, Gwasg y Brython in 1897 in Liverpool. 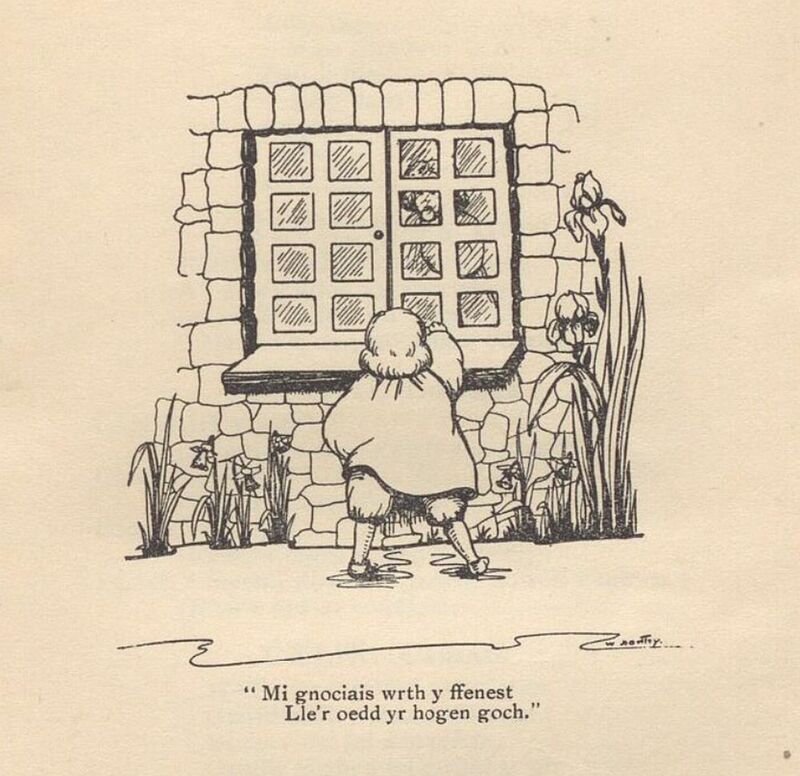 However, his children’s book ‘Y Tylwyth Teg’ was published posthumously in 1935. This volume was also packed with illustrations and the tale was later republished in several editions. Here’s a selection of volumes by expatriate writers that will be digitized as part of the project. 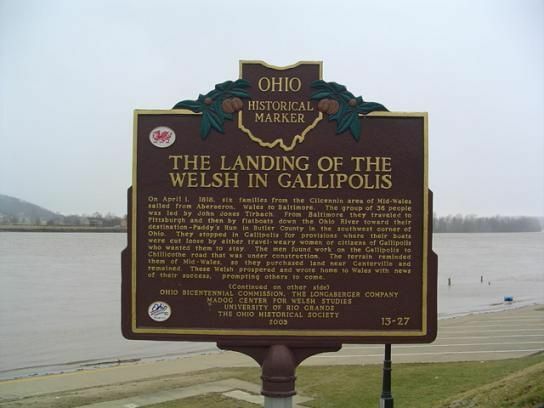 Ellis Pugh was a Quaker emigrant and became a member of the Friends Church from the age of eighteen. 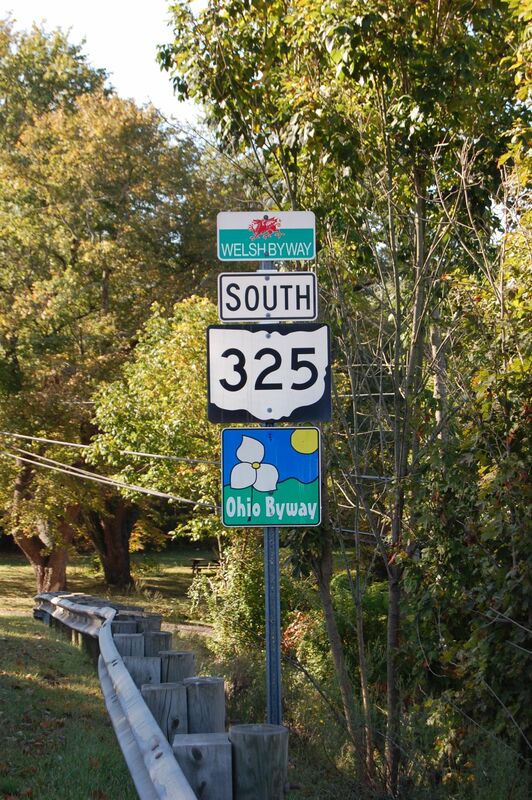 In 1686 he, along with his family and many other Welshmen, began the lengthy voyage to Pennsylvania. 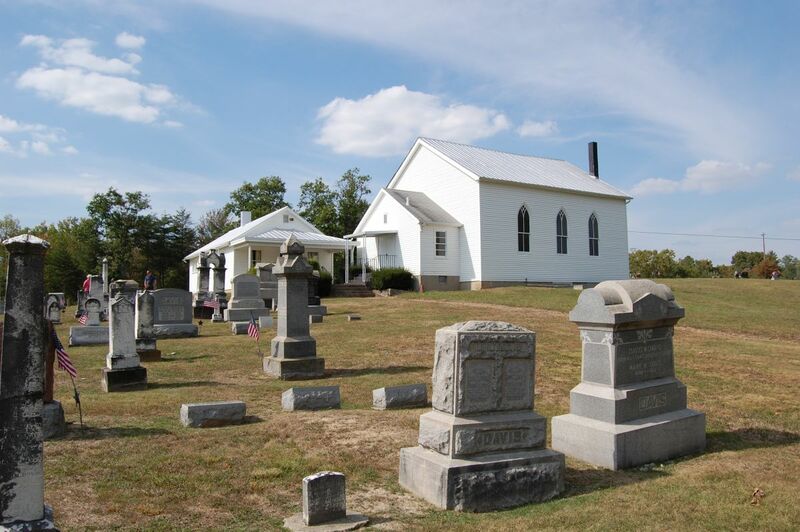 Pugh settled as a farmer and minister in America during the summer of 1686. He left, in manuscript form, a work entitled ‘Annerch ir Cymru’ (‘An Address to the Welsh, to call them away from the many things to the one essential thing to ensure the salvation of their souls’). 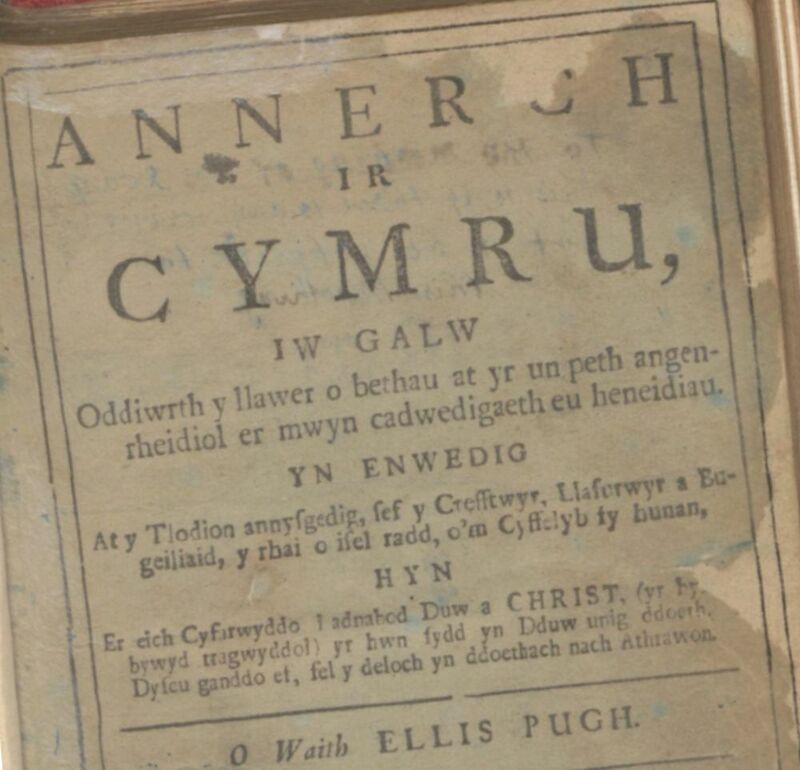 This particular copy was published in Philadelphia in 1721 and is accepted as the first Welsh book to be published in North America. As in Wales, printing became the most effective way of transmitting religious values and beliefs. 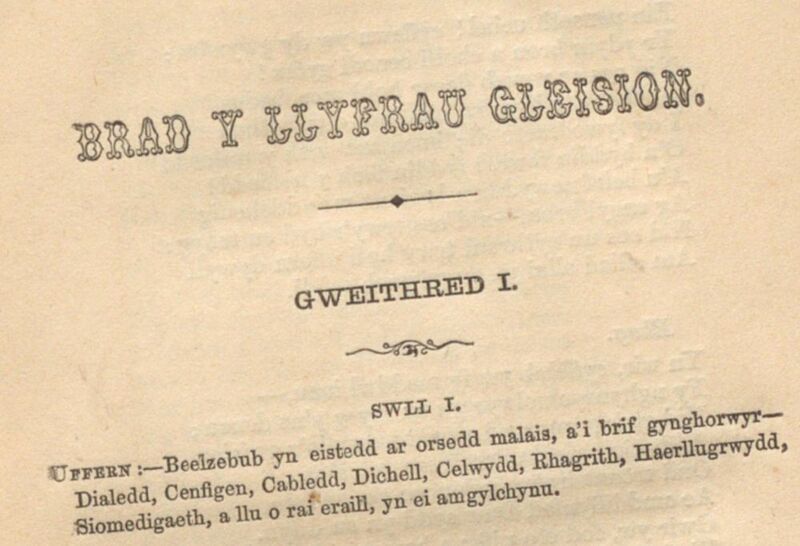 This monumental publication consisted of early Welsh poetry and Brutiau, or Chronicles. It was published in three volumes, two in 1801, and the other in 1807. 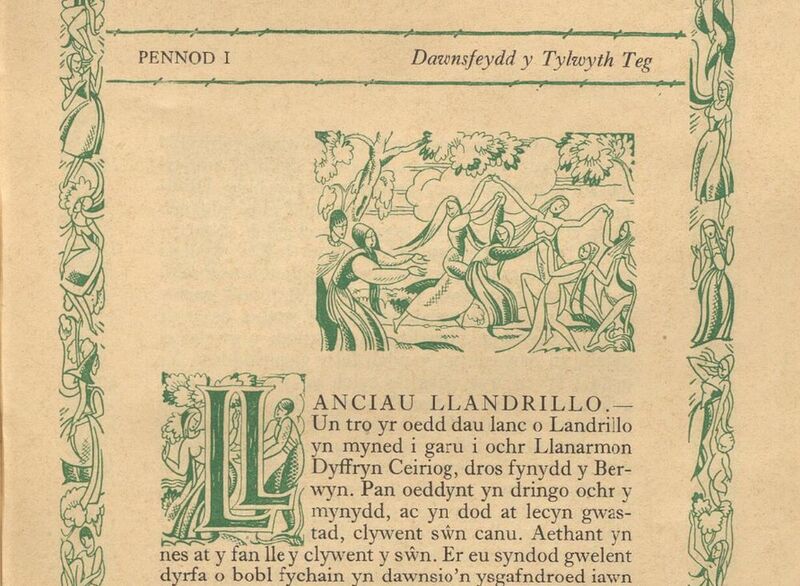 To many scholars, these publications symbolise the end of the Welsh language manuscript era. Owain Myfyr and William Owen Pughe were mostly responsible for bringing these volumes into print; they were also assisted by Iolo Morganwg in the process of compiling their contents. 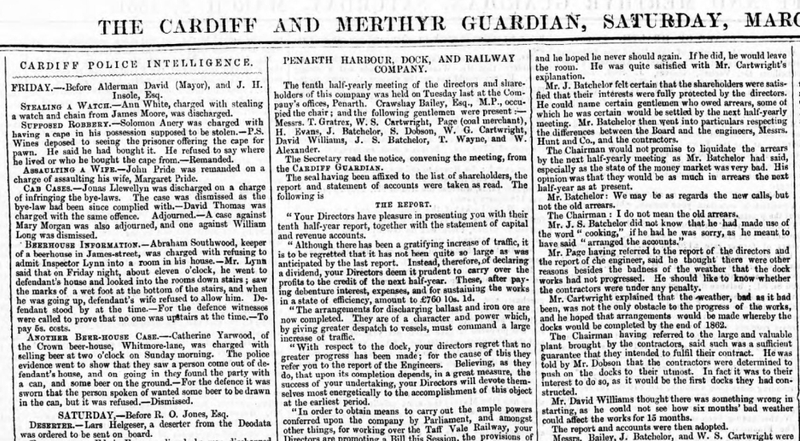 It must be noted that Myfyr’s fellow-contributors were eager to name the publication after him as he made extraordinary financial contributions to the enterprise, an estimated four to five thousand pounds. Iolo travelled the length and breadth of Wales in search of materials which Pughe structured and prepared for press. Unfortunately, the venture was not entirely a success and they face difficulties with the transcription process. In addition, the inclusion of Iolo Morganwg’s infamous forgeries did not do the publication any justice in terms of later circulation and sales. Edward Williams (more widely known by his pen-name, Iolo Morganwg) was a poet, writer and antiquarian. 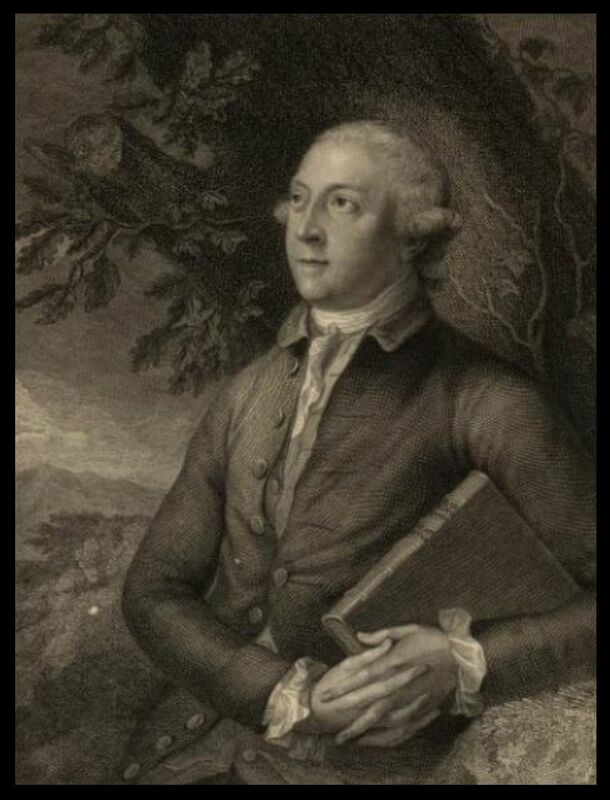 He had strong connections with the London-Welsh societies of the late eighteenth century, and was particularly affected by the cultural and antiquarian developments of that period. In 1792 Iolo Morganwg held the first meeting of the Gorsedd of the Bards of the Isle of Britain in London. During the occasion he introduced a form of druidism, later discovered to have no true historical root. Morganwg is arguably the most controversial writer and poet Wales has even known. 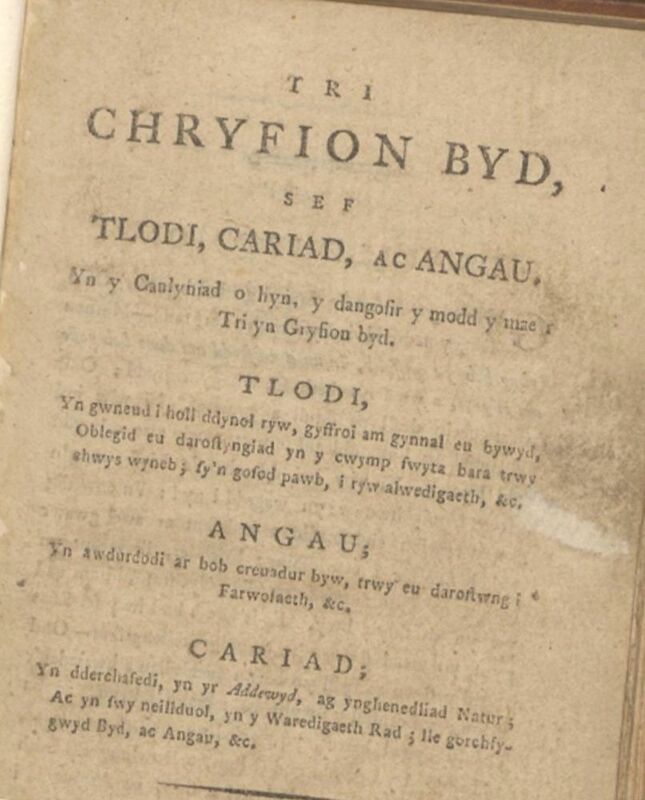 He did not live to see his volume ‘Cyfrinach Beirdd Ynys Prydain’ in printed form. It was published in 1829, three years after his death. 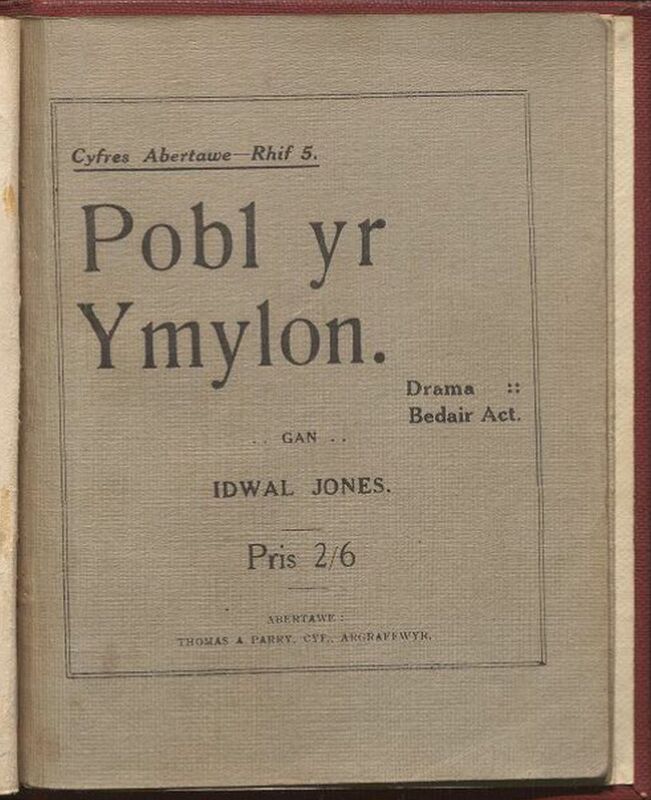 This truly unique thesis on the origins of the poetic art of Wales demonstrates Iolo Morganwg’s firm grasp on the subject. However, both his broad knowledge and extraordinary imagination are evident in ‘Cyfrinach Beirdd Ynys Prydain’. 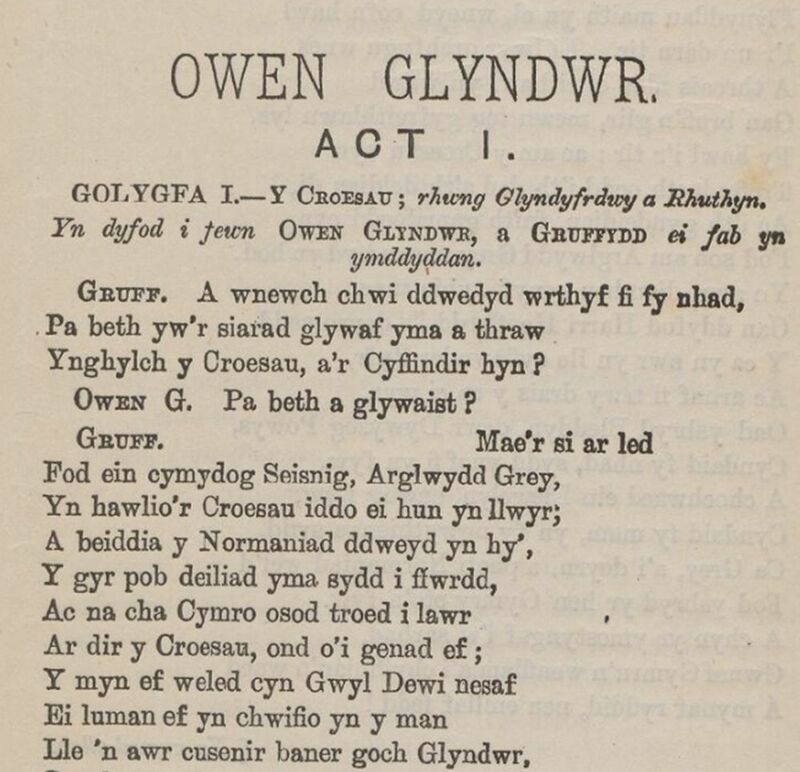 In this volume, he rejected the pre-standardised poetic forms introduced by Dafydd ab Edmwnd in the fifteenth century and proposed in their place old strict measures as well as newly formed ones. Morganwg supported his propositions with falsified examples, derived from ancient Glamorgan poets, which also served as proof of the literary excellence and authority of his home county. Below is a selection of ballads that will be contributed as part of the project. 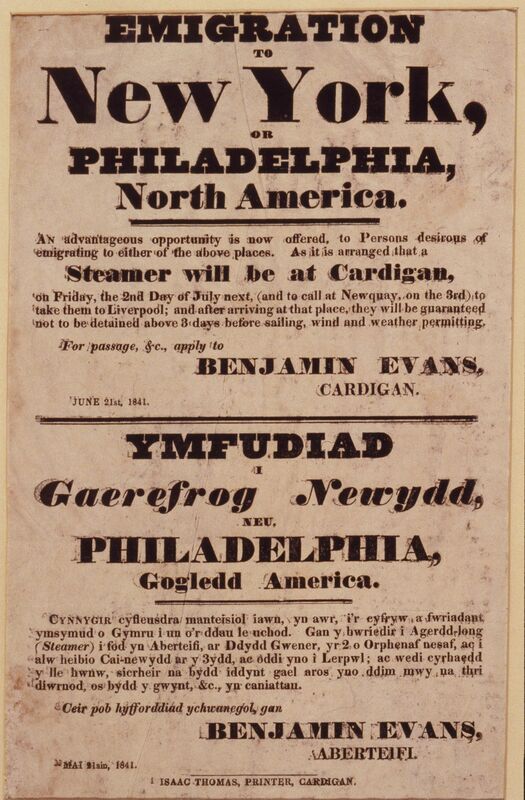 Ballad-pamphlets were produced on a mass scale by the new printing presses in Wales during the eighteenth and nineteenth centuries. Hawkers often sang ballads aloud in the market-place or at the fairground. With regards to content; some were of a religious and moral tone and others discussed historic and current affairs; such as local and national crimes, riots and industrial accidents and incidences. 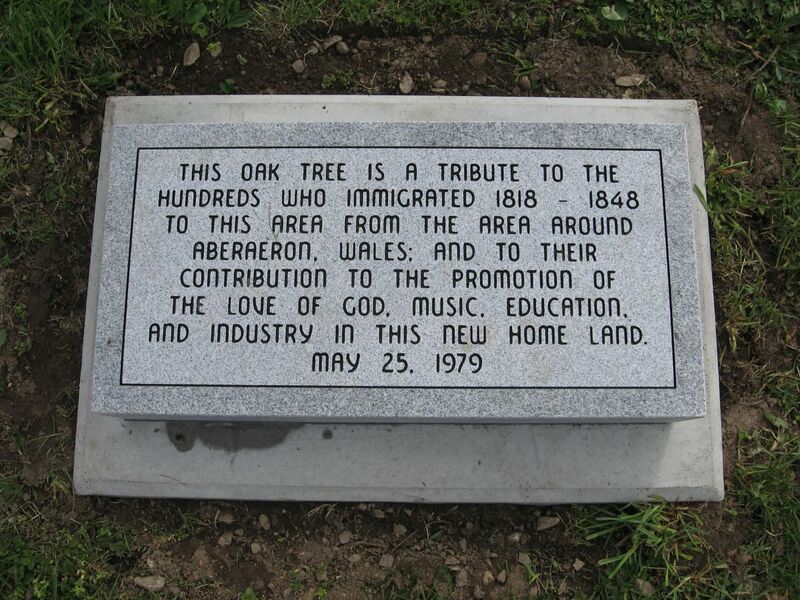 The ballad played an important role in the social and cultural life of Wales during the eighteenth and nineteenth centuries. 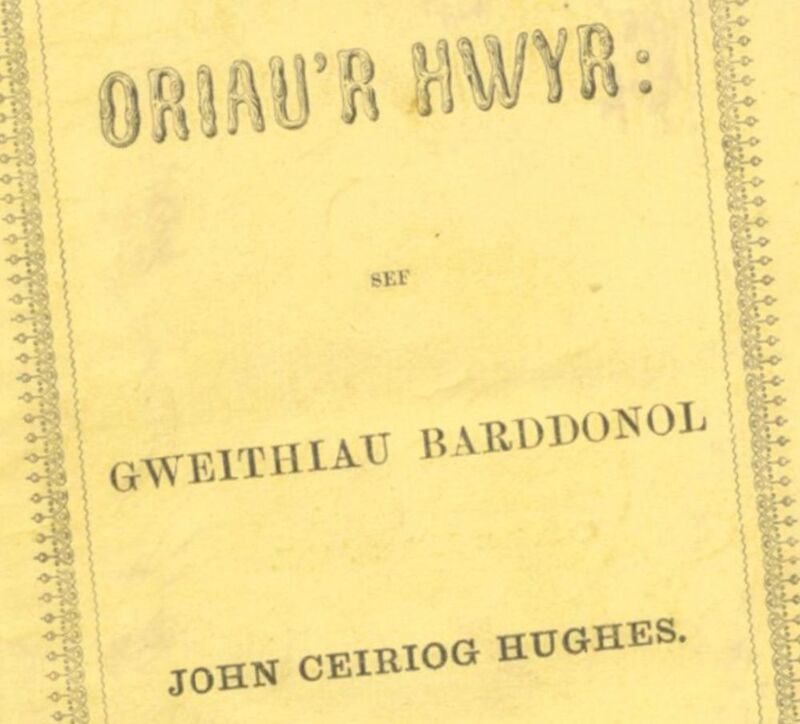 By the nineteenth century ballads were being printed at 96 towns and villages across Wales and were bought in their thousands, often by individuals of the lower classes. Their populist nature attracted and recruited many new Welsh readers. 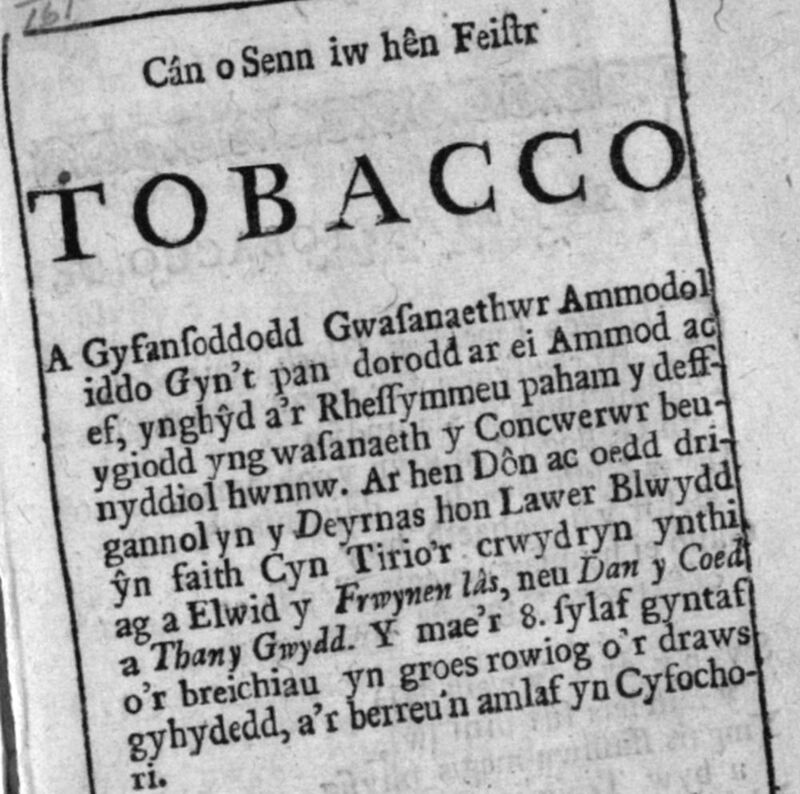 ‘Cân o senn iw hên feistr Tobacco’ was the first ballad to be published in Wales by an official press. 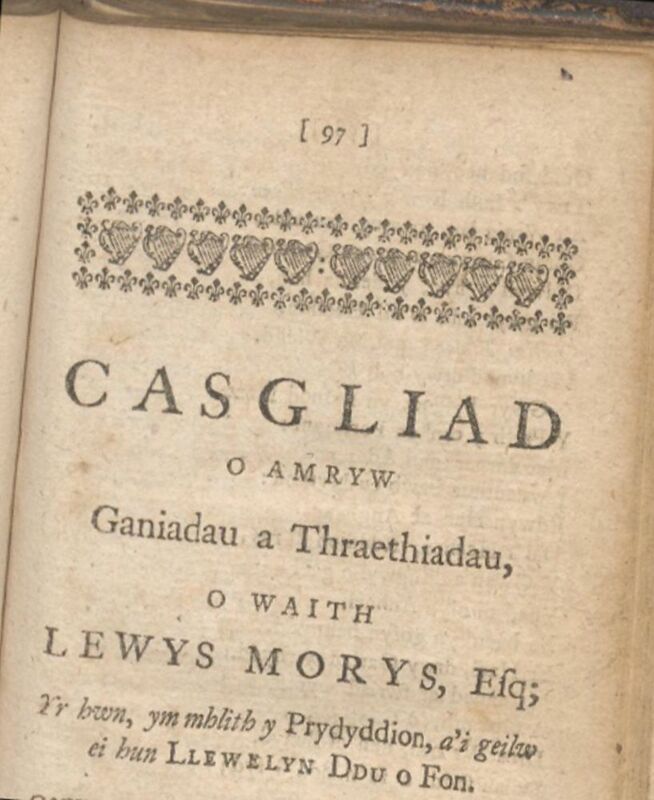 It was published by Isaac Carter’s Press at Trefhedyn in 1718. The ballad discusses the evil and immoral nature of tobacco. 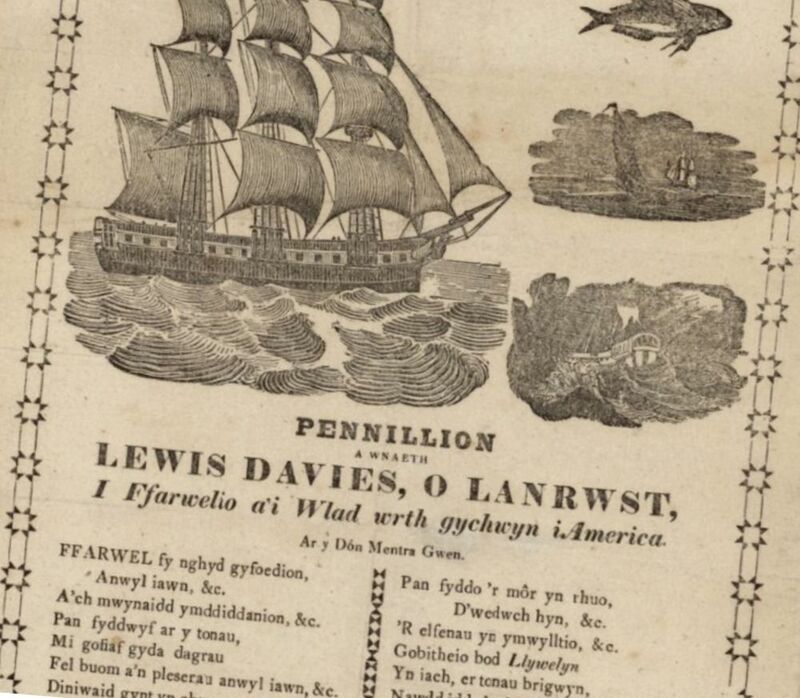 Lewis Davies, ‘Pennillion a wnaeth Lewis Davies o Lanrwst, i ffarwelio a’i wlad wrth gychwyn i America’, 18?? Lewis Llanrwst Davies bids farewell to his fellow-countrymen as he begins his journey to America. 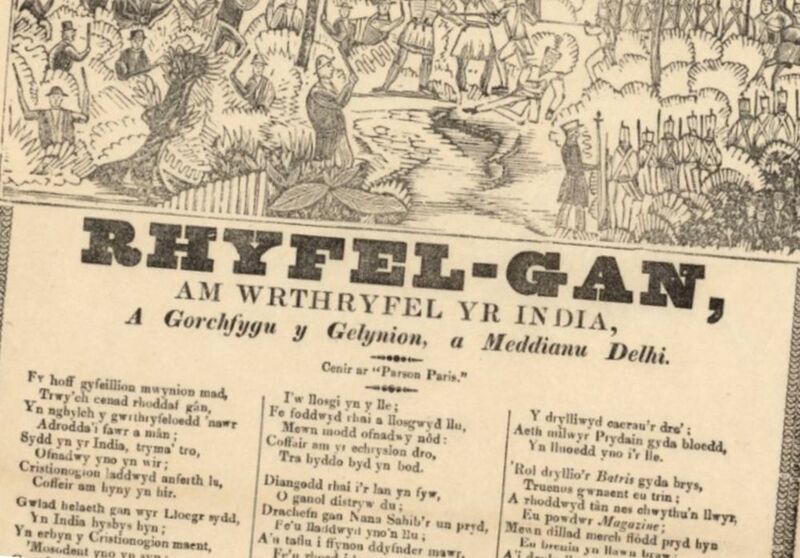 Ywain Meirion, ‘Rhyfel-gan, am wrthryfel yr India, a gorchfygu y gelynion, a meddiannau Delhi’, 18?? This broadside is a war-song. Meirion discusses the insurrection of India and the defeat of the ‘enemy’ as the British army take possession of Delhi. 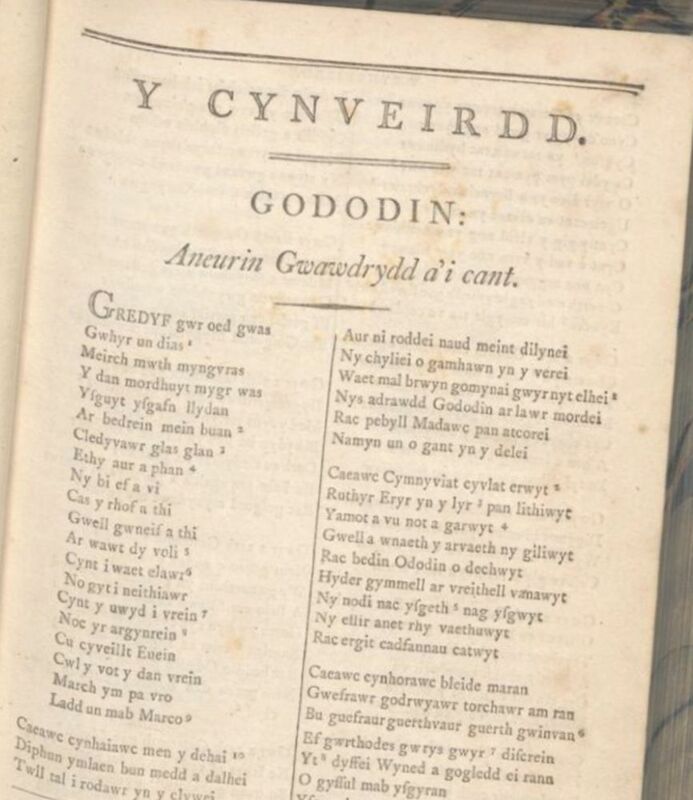 Unknown Author, ‘Ymweliad y cholera, ynghyd â galwad ar bawb i ymofyn am gymod â Duw cyn eu symud i’r byd tragwyddol’, 18?? 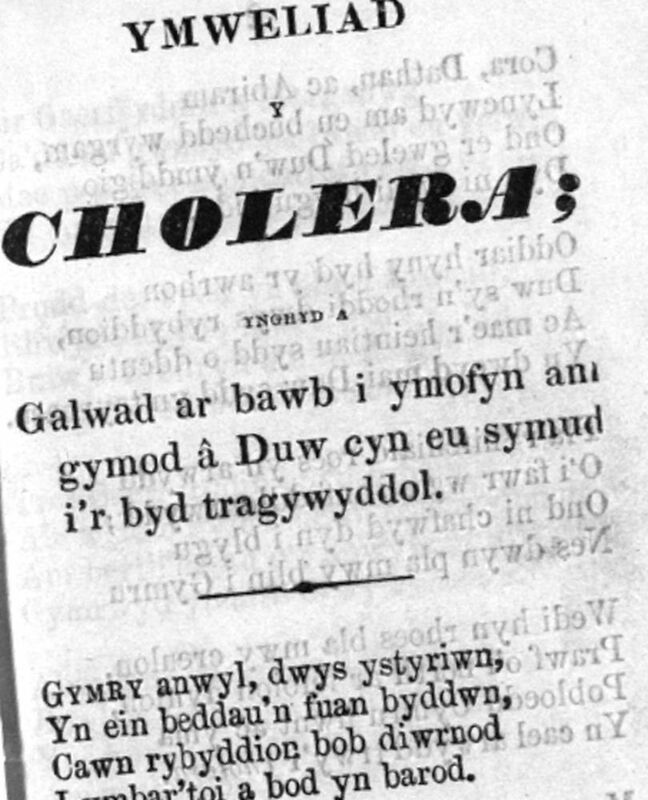 This ballad introduces two warnings with regards to the cholera epidemic in Wales. It informs of the disease, and it calls on every sufferer to seek reconciliation with God before moving to the eternal world.